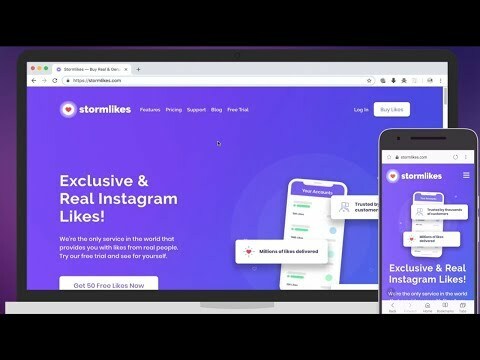 🥇 Stormlikes Review - Too "Cheap" To Be Real Instagram Likes? Stormlikes is yet another service that promises to provide you with Instagram likes and video views in exchange for your money. You can buy likes for your Instagram posts or views for Instagram videos, and the service claims to deliver them through “real users”. In addition to that, the service offers features such as targeting by country and gender, random number of likes on each post, and the option to delay the delivery of likes for natural progression of a post. To add some icing on that cake of features, the service also comes with a nominal subscription fee. But since all of these benefits in one platform sounded too good to be true, we had to check it out for ourselves. Here’s what we found. One of the most important aspects for any of such services is the speed at which the likes are delivered. Storm likes come at a speed that is too fast to be realistic. A major selling point of the service is that your posts get noticed a little after 30 seconds. It makes good on that promise alright. However, the influx of likes that come within a few minutes after that make it clear to actual users and your target audience that there’s something fishy going on with your likes. While the service does state that it lets you “delay your likes”, the damage is done by the time you get to that option. To add to that problem, no extra options are available to change the delivery speed besides “delaying the likes”. Storm likes may leave a lot to be desired in terms of delivery, but it doesn’t disappoint when it comes to the quality of accounts from where you receive likes. The accounts that come with the service have their own social media standing. They have profile pictures, user engagements, and followers of their own, which makes your received likes to seem more authentic. Since this is something that goes a long way in building your Instagram presence to others, this aspect sings strongly in favor of the service. Another thing that sets the service apart from others is how you can actually set targeting options for accounts from where you want to receive likes. You can choose to receive likes from a list of available countries. You can even select whether you want more likes from a specific gender. The options work as they are intended to. You get likes from specific regions, which is something that works as a plus point if you want to build your Instagram fan base in a specific niche. Randomization Can Be Put to Work A nifty feature on the service is how you can set the option to “randomize your likes”. Let’s say you have 10 posts on your Instagram account. Each of those posts has around 250 likes, no matter what time of day they were posted or what the actual content of the post was. That would seem suspicious to others, wouldn’t it? This service lets you steer clear from those dangerous waters by letting you randomize your likes on each post. But the catch is that this option is only more usable by those who purchase monthly plans from the service. The support on the service is not out of the ordinary, nor does it leave a lot to be desired. There are no live chat options or a direct phone number available, but the website does have the option to send email or ticket-like inquiry messages. When you send an inquiry, you receive a response within a few minutes to a few hours, which is a normal turnaround time for a service of this kind. One of the things that stood out to us while assessing the service is how it offers a few payment options, but not so surreptitiously leaves out PayPal. This could be irksome to a lot of people since they then have to get their credit cards out of their pockets. The lack of Paypal integration is a bit concerning for a variety of reasons but one them is a huge red flag. The biggest advantage of using PayPal over such services is that you can file disputes if things don’t turn out as expected. That’s why, this service’s avoidance to accept PayPal is a red flag. Some online reviews point out that the site did use to accept payments through PayPal, but it stopped providing the option. This lack of a PayPal payment option could mean that the service is either trying to avoid disputes, or that it got so many disputes that it couldn’t use PayPal anymore. This is a factor that you would have to watch out for. The service can be a great option if you are looking to receive likes from accounts that seem real, but are not too concerned about how fast those likes are delivered. While the most glaring problems we noticed pertained to delivery speed and the convenience of payment options, the service does have an overall positive note to it. All in all, it could definitely be given a try if you are assessing a few services before choosing one for good. With the current promotion that the provider has running at the time of writing this review, you can get 50 likes for free and test the quality of accounts and speed of delivery for yourself.